Created by the University of Windsor Act of 1962, the University of Windsor operates on a bicameral system of governance. 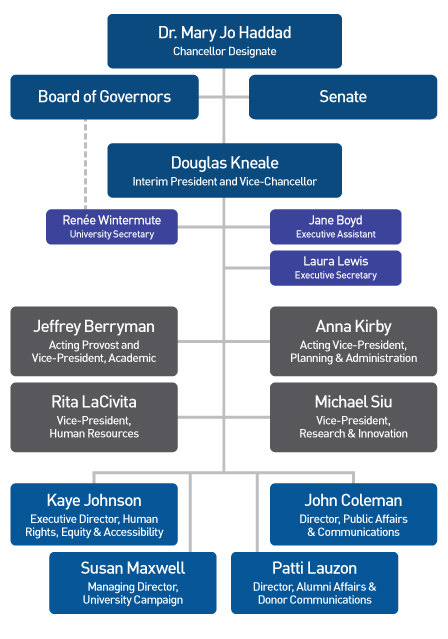 The Board of Governors is responsible for the oversight of all operational aspects of the University. The Senate is responsible for oversight of academic matters. Both governing bodies have bylaws and policies that guide their activities. The Chancellor Designate, Dr. Mary Jo Haddad. University offices closed for Christmas recess.